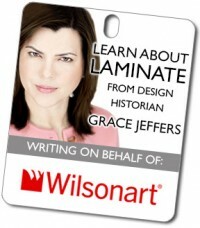 Laminate basics: The invention of laminate. How is laminate made? What is laminate made of? In essence, laminate is a skin, supplying a supplemental finish that is both ornamental and lasting. In this way, it is a veneer: a thin surface that cannot be used without a substrate. Laminates are usually applied to a substrate of inferior aesthetic and economic value. In the architectural and interior design trades, laminates are categorized as a “surfacing material” or a non-essential overlay, a material applied to achieve an aesthetic effect or to serve a durable function. 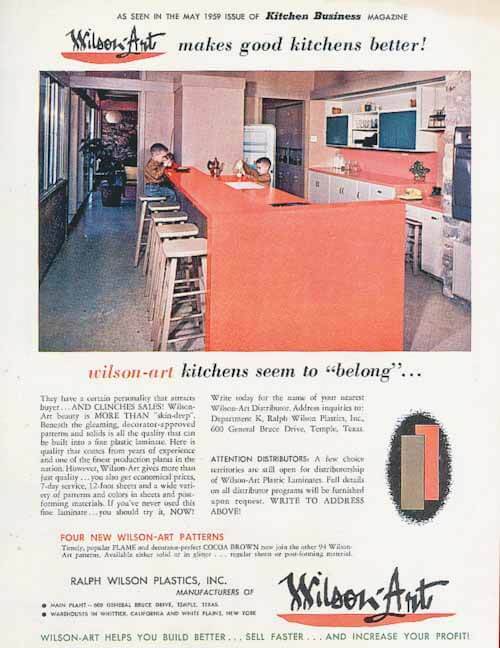 want to make it very clear: This is not a typical”product placement” or “sponsored post” — Wilsonart is not paying me anything to run these stories. I accepted the series proposal because I thought the content would be great for Retro Renovation — and because I’m thrilled to be working closely on this project with Grace. Read Grace’s complete bio here. 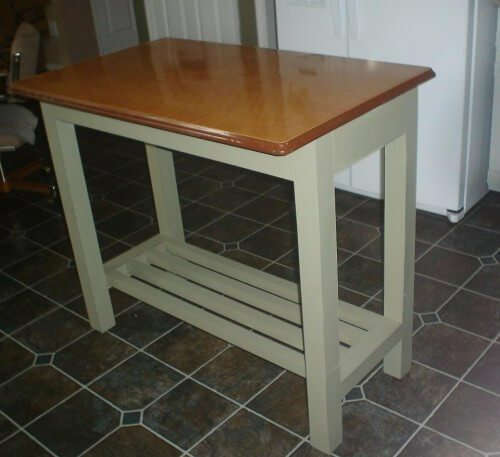 It surprises many people to learn that laminate, the material commonly found on kitchen counter tops, has been around for more than 100 years. The first laminates were what we call industrial laminates. They were not decorative — instead of being patterned or brightly colored they came only in a caramel brown color, a result of the polymer resin that was used to make them. These first laminates were made using only phenolic resin, the same polymer used in Bakelite jewelry. Not surprising, as the man who developed phenolic resin in 1906, Dr. Leo Baeckelund also invented Bakelite. By 1907, laminates were being made at Westinghouse in Pittsburgh, Pennsylvania. The first laminates were made as casing for electrical parts, mostly in the form of gears and tubes. Two employees at Westinghouse championed sheet laminates, but the company did not see any benefit to producing them. In 1913 those two employees left to form the company we know today as Formica. 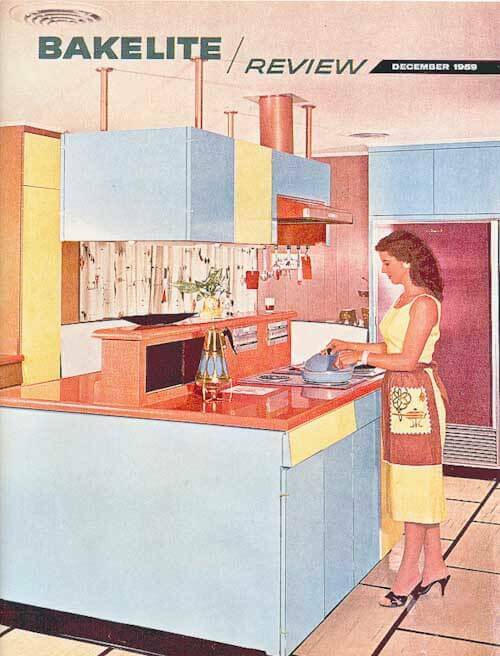 Why, when we think of laminate, do we think of America in the mid-20th century? Initially, laminate was made purely with phenolic, which could only be used to produce a caramel brown colored finish. It wasn’t until 1938 — following the invention of a new kind of resin, melamine — that laminate could be engineered with a top layer of colored paper. Melamine bakes, or “flows”, to create a hard, clear, topcoat finish, which bonds and protects the “decorative” paper layer beneath. 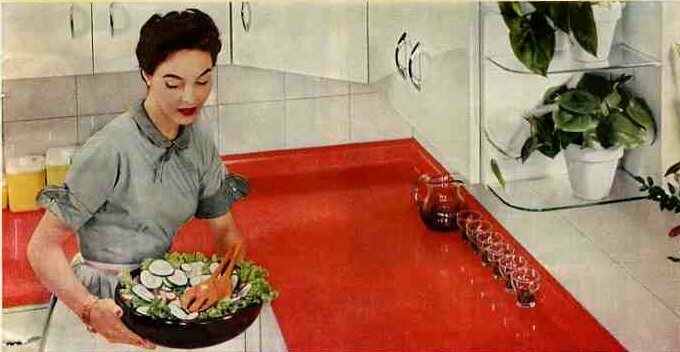 This important invention made the brightly colored laminates we associate with kitchen counter tops of the 1950s possible — and opened up a brand new world of design possibilities for American kitchens and bathrooms. Given the state of the American economy in the late 30s, laminates were not marketed to the consumer until the very end of the 1940s, after the Second World War. Consumers ate this new “modern” material up — laminate became simultaneously popular in commercial settings, such as diners and bars, and in the home as dinette tables, cabinetry and counter tops. Laminate was seen as a modern marvel. It was bright and cheerful, impervious to stains, easy to clean and never required polishing. Think about the other materials that were used for the same purposes: Marble was porous, stained and was cold to the touch. Wood stained, scratched and required polishing. Linoleum could be scored, it stained, and it yellowed with time and sunlight. Today, laminate is called by many names: laminate, plastic laminate, p-lam, and yes, sometimes it is called generically by the brand name Formica®. In Canada, it is often generically called Arborite® because in the post-World War II era that was the name of the company that made and popularized it there. There are currently five main brands of laminate manufactured in the United States: Wilsonart®, Formica, Pionite®, Nevamar® and Lamin-Art®. Of these five companies, only Wilsonart and Formica are available to consumers through home centers. Some additional laminate brands are imported for sale in the U.S., including the Italian manufacturer Abet Laminati, the company that supplied the colorful laminate to the Memphis Group and Studio Alchimaya. Laminate is a misleading word because it literally means made of layers, layers that are also called laminae (plural) or lamina (singular). By this definition, plywood is a laminate and so is chocolate-layered cake. The laminate we know and love as a surfacing material – used most often for kitchen and bathroom counter tops — is more accurately called High Pressure Laminate (HPL) or specifically decorative high pressure laminate since there are also industrial high pressure laminates which are not decorative. The decorative high pressure laminates in our homes consist of sheets of paper that have been coated or impregnated with two types of resin, stacked on top of each other and placed into a press where they are cooked at a minimum of 265 degrees F. at a pressure of approximately 1,200 pound per square inch (psi) for about an hour. Under this pressure and heat, the resins flow and the stack and the resins transform into a single sheet of homogenous composite material. It surprises most people to learn that plastic laminate is approximately 70% paper and 30% polymer (phenolic and melamine) resin. Plastics. Polymers. Resins. Phenolic. Melamine. Chem 101 time: Let’s get to know how to use our terms correctly.Plastic is a word that means “capable of shaping or molding,” from the Greek plastikos meaning “able to be molded”. Horn is a natural plastic, it can be heated and bent into a shape. Tortoise shell is as well. Phenolic and melamine are synthetic plastics. All plastics are polymers.The word polymer comes from the Greek polymeres meaning “having many parts”. Polymers are categorized by how they are constructed on the molecular level; they are made up of strands of connected units of the same size, like a beaded necklace, or many, many beaded necklaces all mixed together. It is the organization of the molecules that ultimately determines what material is, and polymers are the only material that demonstrates this “beaded necklace” order.Plastic or Polymer? The general public uses the words interchangeably but an engineer or a material scientist would only refer to polymers. Resin is another word that we commonly confuse. Merriam Webster Dictionary defines resin as a group of natural, flammable, fusible organic substances that are formed as secretions in plants. They are soluble in organic solvents, but are not water-soluble. Resins can be solid or semi- solid, and are usually transparent or translucent and yellowish-brown in color.As you can see, following the strict definition, resins are natural. Pine resin is the original “resin”; the Greeks called it rhetine, which is the root of our English word. Amber is pine resin hardened into a semi- precious stone-like nugget. Any plant that produces sap is producing resin. Resins are also polymers, polymeric in their structure. They are used in varnishes, printing inks, in medicine, and in plastics.But our modern definition of laminate is broader and more confusing, because we have added the concept of synthetic resins into the mix. Natural resins are natural plastics—they are moldable polymers found in nature. Rubber is a natural resin, the sap of the rubber tree—it is also a natural plastic. We call the liquid state of polymers before they cure “resin”; when cured, they form plastics.Now — don’t you feel much smarter already today! The top layer of this laminated stack of paper is a sheet of melamine-impregnated alpha cellulose overlay paper. This special type of paper is made with very high-grade wood fibers (‘alpha’ meaning ‘first’, and ‘cellulose’ meaning ‘insoluble substance that is the main constituent of plant cell walls’; both cotton and wood produce cellulose). The paper is white in color when dry but very porous, not unlike very thin toilet paper. Between the paper and the melamine, this layer becomes completely clear in the pressing. The clear, tough melamine/alpha cellulose top overlay lies on top of the second layer of the laminate — the decorative layer. The decorative layer of laminate gives the counter top (for example) its design or color — its aesthetic appeal. The decorative layer also is permeated with melamine, which is pushed through the overlay sheet and penetrates into the decorative layer. 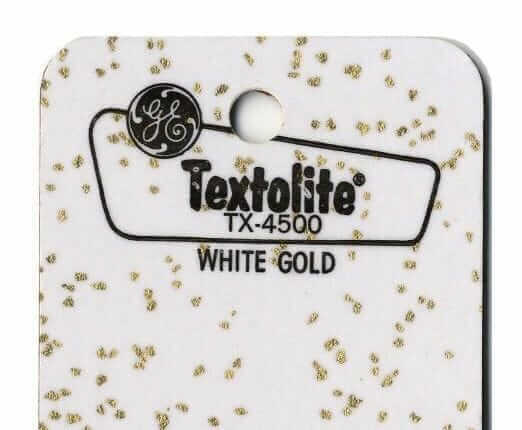 The decorative layer can be created in three different ways: It can be a digital print (white paper which is printed with a wood grain, stone or abstract pattern); it can be a solid sheet of color; or it can be a solid sheet with “inclusions” (such as gold glitter, a Retro Renovation favorite not currently available in North America). The core consists of layers of kraft paper treated with phenolic resin. There are three basic grades of laminate: vertical, horizontal and post-forming. The main difference between the three is the number of layers of kraft paper. Kraft paper is the same kind of brown paper used for grocery bags. The word kraft comes from German and means strength. The kraft paper used in laminate is often made of recycled material. Since it is only the backing material and will not be seen once the laminate is installed, it is possible to use a thicker, less aesthetically pleasing paper, as opposed to the thin alpha cellulose paper used in the top layer, which is milled thin enough to “disappear” when imbued with resin. 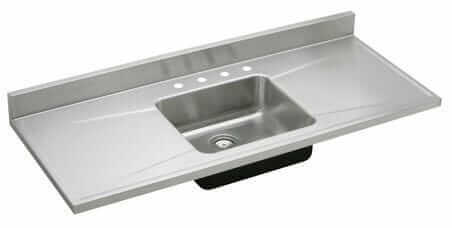 All three layers together equal one of the most popular counter top innovations ever. The melamine overlay of the top sheet and the kraft paper layers underneath work in tandem to create a laminated material that is stronger than each material on its own. Scientists and engineers sometimes refer to laminate as a composite material because composites work the same way: Two materials combine to make a third, even stronger, material. High Pressure Decorative Laminate (HPDL) meets an industry standard for wearability, scuff resistance, stain resistance to 29 different agents, radiant heat resistance, conductive heat resistance, UV light resistance, blister resistance, cleanability, appearance and post-forming capabilities (its ability to wrap around a radius). Because of its early use as an electrical insulator, laminate was associated with standards set by the National Electrical Manufacturers Association (NEMA). ASTM International, formerly known as the American Society for Testing and Materials (ASTM), is now associated with test methods for laminate and most other materials in our homes, such as textiles and vinyl flooring. Laminate today is produced in the same was as it was in the 1950s, with some differences. In that period, laminate had a higher percentage of polymer (phenolic and melamine) resin. The exact percentage is unknown but it is estimated that mid century laminate was 40% polymer and perhaps as high as 50% depending on the grade. Interestingly in today’s laminate, the paper-to-polymer ratio makes for a stronger material. It has been said that gram per gram, laminate is actually as strong as steel. 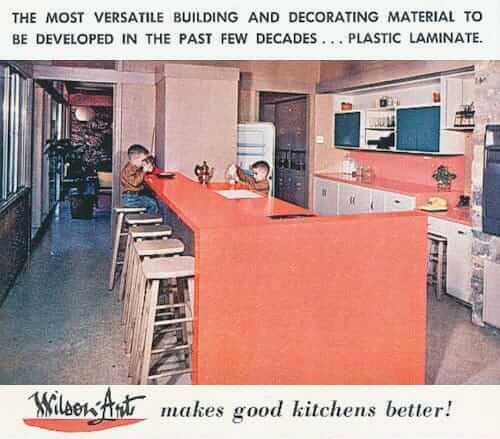 Mid century laminate also has a different hand-feel than today’s laminate. It feels almost oilier, slippery in a different way. Part of this texture is due to the finishing technique, which will be described in a later story. For more information on how laminate is made, visit Wilsonart’s information page here. Thanks for this fascinating post. It’s amazing to me that the original countertop laminate in my 1956 bathroom still looks fresh. Perhaps you will address this in a future post, but I’m curious why there is so often a chrome strip around the edge of a laminate countertop in MCM homes. Was this a functional element or purely a design element? I have a question in regards to restoring a cracked ice Formica table top from the 50s. I purchased a cute table at an auction. The auctioneer put a sticker (1″ x 1″) on the top of the table on the Formica part. When I peeled the sticker off, the top the Formica’s color was its vibrant self, as if it were brand new. Then, where something else was also laying on the table, the same thing occurred. How do I get the top to be uniform in color again. It seems to me that light/darkness has something to do with it. I tried covering the entire table with painters tape to see if I could mimic the “sticker” result but nothing happened. Any help would be greatly appreciated. Thanks so much! At present, I have dark plastic covering the table to block any light getting to the top to see if that does anything. What is the difference between HPL and TFL then? How is TFL made? Is one better then the other? Does their tend to be a cost difference? Thanks! 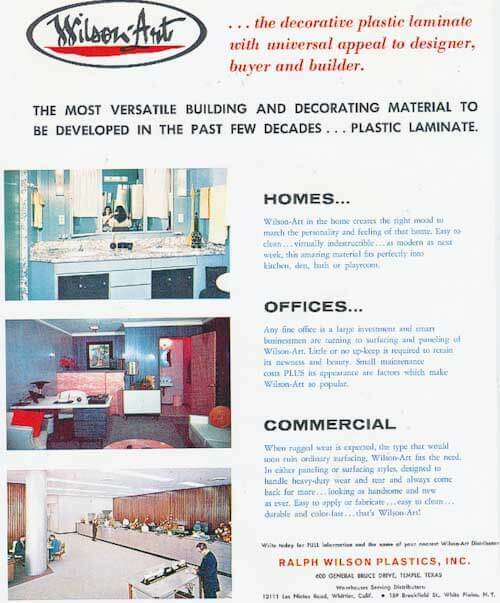 Fascinating… If Laminate wasn’t used on countertops till post-WWII, any guess what types of materials may have been used in streamline moderne homes in 1940? My house had tile, but I don’t think tile will work with my ‘new’ vintage cabinets. I enjoyed reading this informative article. Thanks!